Every person who progresses in this way will be enriched because it is an exact science, so failure is excluded. My name is Grazyna I am a pięćdziesięciokilkuletnią woman. I want to tell you my true story. There is a year 2008, I am very poor. After divorce with her husband an alcoholic, with debts, with a bailiff on his salary. The life and payment of accounts is 560 to me, and what is the worst-life under the common roof with former husband, alcoholic and adventurer, whom nothing is interested. I will never forget. It was the autumn of 2008, as I usually came to work depressed and then I noticed how my friend reads something stealthily. I had never been curious, but this time it was so strong that I couldn’t stay out of curiosity. She read the book The Secret. I remember how much I asked her to give me a little read, it was so strong. I read it I do not know how many times. Then I had such a muddle in my head, so much I wanted to talk to people or know something about it, but not once looked on me as oszalałą. I remember in the beginning of the year 2009 quite accidentally found on the Internet blog Wojtek Secret of Life in abundance, even have no idea what I was happy that it’s true. I remember how quite timidly I wrote to Wojtek the first email asking for a key System and how I wrote that I could not afford to buy. I received a gift from Wojtek, mother as I was happy and then I started to learn. After some 2 months it occurred to me that I had to start thinking about cardboard boxes – yes, those ordinary cardboard boxes in which they are packaged. So much I wanted to change my life. I started imagining myself that I’m packing in these cardboard boxes. My dreams became real, actually I started to bring cardboard boxes to my home, but I didn’t really know why. And again after a while, the thought appeared in my mind that I was leaving. I really didn’t have any options: salary is still the same, debts and bailiff. I started to firmly believe that it succeeds. This desire for the lead was very strong. And after a month I met a friend who did not I quite a long time, and during this conversation I found out that looking for someone on the room, in my head immediately zobaczylam my cardboard boxes. Yes, I moved it to a rented room. In a housing cooperative, I asked for the distribution of debt in installments and I raised a certificate of check-out. I was without meld. I was glad that I had peace, but I that I could not live for the rest of my life on a rented room. On the one hand, joy, on the other hand, the question of what’s next, how many times I cried – one night. But Powtarzałam “I succeed, I succeed.” And one night I woke up and came to my mind to buy an apartment. I started laughing. Because I didn’t have any, but it was no possibility. I remember the moment when I was in doubt. I do not give advice-the bailiff, the installment of the apartment, barely enough for a poor life, and here the apartment-it was outside my dream range. But something still kazało to think about the apartment, sometimes until I was evil. And in this anger cut from the newspaper’s picture of the apartment, I even liked this picture, I started again stare in this picture and think about the apartment. 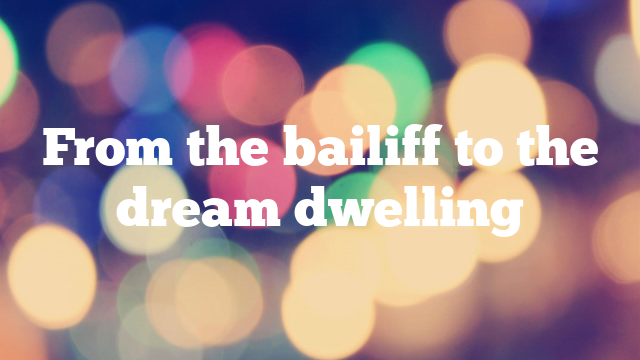 The same situation a month later – remember the evening again the thought: “Go to the Bailiff”. It seemed awfully silly, why am I going to go there, after all, it will not help me. However, umówiłam to this conversation, I was not easy to go there, but still kazało something and said “go”. It was a really friendly and human person, I told him my story and my plans. I remember how he wrote something. After two days I got a call from the bailiff I would come again to the interview, I was sure that none of this will not. It turned out to be different. This gentleman took me off the bailiff’s salary, which did not remove me from debt to this institution. Same wpłacałam as I could. One afternoon I got out of work and met a colleague from school years, whom I have not seen before, and so I ucięliśmy a chat. After this conversation, a colleague from the wife wanted to visit me, still zwlekałam with this invitation to them, because ashamed say that I live in a rented room. During the next talks, a colleague with his wife did not give a win. Umówiłam with them for coffee in the city and I decided to tell them the whole truth, because no longer could lie or invent stories. And again the same story-the wife calls a colleague asking if I could fall into them on chatting and coffee. I went to them, but it was strange to me, actually it was my shame that the mature woman, and there is nothing. During this interview, my good friends offered me financial support. I didn’t want to accept it because I knew I had no way of paying it. Then I heard that I do not have to hurry, that I can surrender as I will have. I took the coins and the next day I went to the bailiff to settle the debt. A week later, I got a certificate from you that I would not zalegam with any debts. In the housing cooperative, I already had a clean account. I remember how I left the job – it was so warm, I decided to sit on the bench and look at people. Quite unconsciously, I sat in front of the bank and at one point came to my mind the idea: or maybe so the credit for the apartment? After a few days I went to the bank – and it was not a single bank, but I still heard the same thing: “We’re sorry, but we can’t give credit, you are in debt-based.” Just then I left all my strength, I felt so tiny, down, even live me interest. I do not know how many days passed-maybe two weeks-they called me from the bank, if I can come to talk, you know-I went, but all hopes have left me and do not know if I thought at all. In the bank, I believed that miracles happen, however, that when I deliver the relevant documents and statements from the bailiff they give me credit. Actually – I got a loan not only from the bank, but from work, I bought myself my dream flat, in which every day I kiss the wall, where the table stands in the same place as in the picture cut out of the newspaper. I am very, but very happy, and my guardian angel watches over me. He writes this email because I want to keep you in the spirit, but it is all possible that it is not easy, but it can go. I wish each of you good luck, and you Wojtku thank you with all your heart. Thank you Grażynko for your wonderful email. Let it serve as a beautiful testimony to all who follow in your footsteps. The beginning of the road is in the scientific book the method of enrichment.